Features: 70 sheets of spiral-bound lined paper. Built-in elastic pen loop (pen not included). Elastic closure. Important contacts page and three-year calendar. 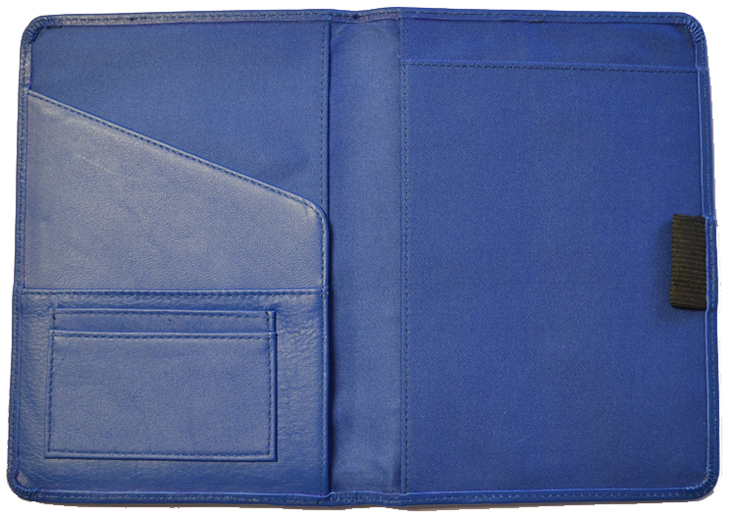 Colors: Black & Navy Size: 10" x 7 3/4" x 1/2"
Features: Made of premium full grain leather. 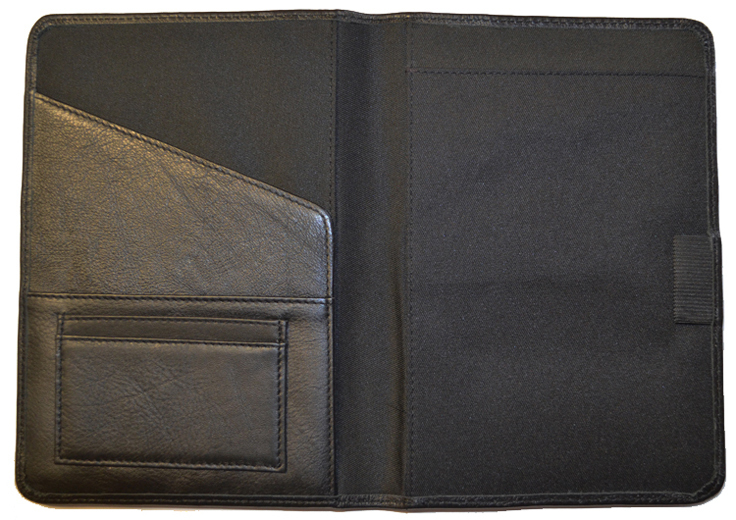 Comes with a sewn in leather page marker, pen loop, inside pocket for business cards. Also comes with your choice of 160 page journal, weekly calendar insert or address book. Standard Die Charge: $65.00. Run Fee Charges: $0.75 per item. The $65 die charge, for a die up to nine square inches, will be added to your shipping fee, with larger dies costing an extra $3.50 for each additional square inch. Features: Faux leather bound journal with an inside back pocket. 80 sheets of lined paper. Matching bookmark ribbon and elastic closure. Colors: Brown Size: 8 1/2" x 6 3/4"
Features: Soft bonded leather journal with 100 white lined sheets and matching bookmark ribbon. Colors: Black, Orange, Blue, Pink, Green & Red Size: 4 1/4" x 6"
Please call us toll free (800) 310-2723 to ask about customization. 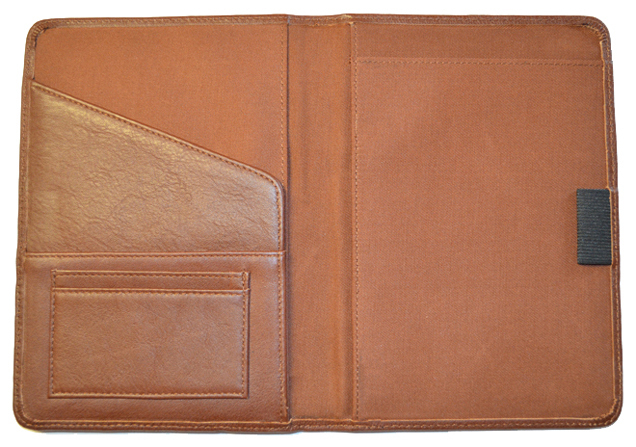 Features: Handmade recycled leather cover with paper from a well-managed re-growth forest. 256 acid-free ruled pages. Elastic closure has the following line with the color of the item in the blank space, debossed on it: "You may think I'm ___ ... but I'm Green"
Colors: Black, Orange, Tan & Red Size: 7" x 5"
Features: Elastic pen loop and blue and silver ribbon page markers. Includes 125 sheets of lined paper. 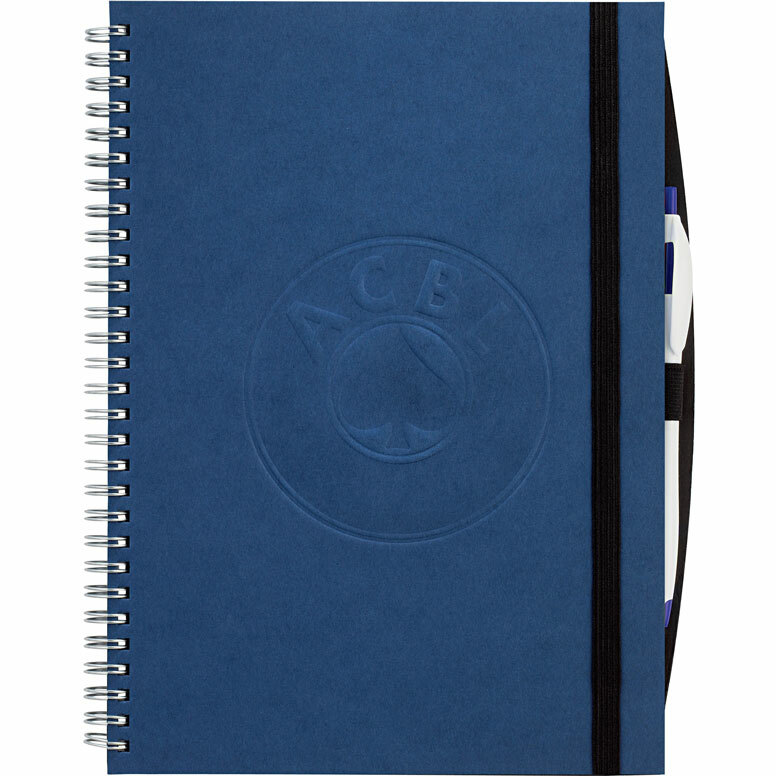 Colors: Black, Terra cotta & Navy Size: 10" x 7" x 4"
Features: Eco recycled journal with pen combo. Ballpoint pen is made out of recycled paper and corn starch. Journal is made out of cardboard with double spiral binding, elastic pen loop on cover and 80 white lined sheets. 70% recycled hard cover and 50% recycled interior. Colors: Natural with Blue Pen, Natural with Dark Blue Pen, Natural with Black Pen, Natural with Green Pen, Natural with Orange Pen & Natural with Red Pen Size: 5 3/4" x 8 1/4"
Features: Completely hand stitched and turned edges, with a foam-padded genuine leather cover, many interior pockets, and a pen loop. Ten business-card-size pockets on the left side, plus a document flap. 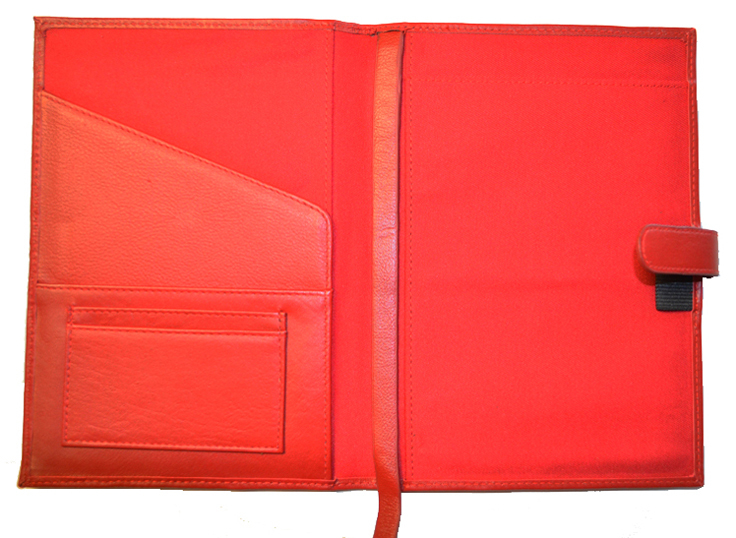 Holds an 8 1/2" x 11" notebook or letter-size pad, with both vertical and horizontal slots on the right side. A 160-page lined spiral journal is included. Features: Eco friendly combo with spiral bound journals made from 72% recycled paper with colored fabric trim, matching elastic closure, bookmark and pen loop, and 80 ivory lined sheets. Recycled paper ball point pen included. 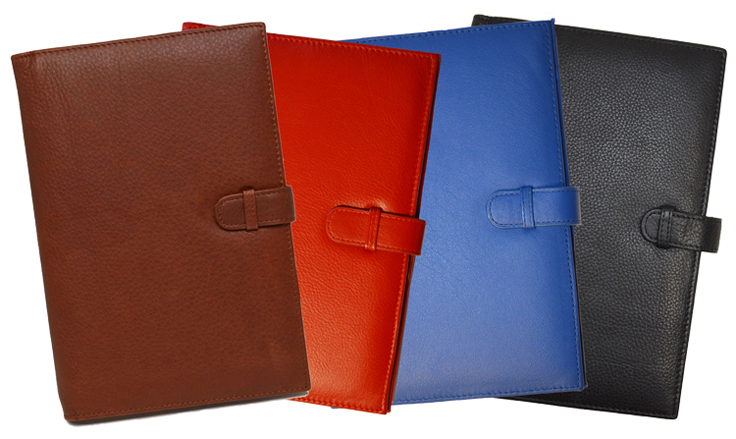 Colors: Black, Blue, Green, Orange & Red Size: 8" x 6"
Features: Made of top-grain leather. 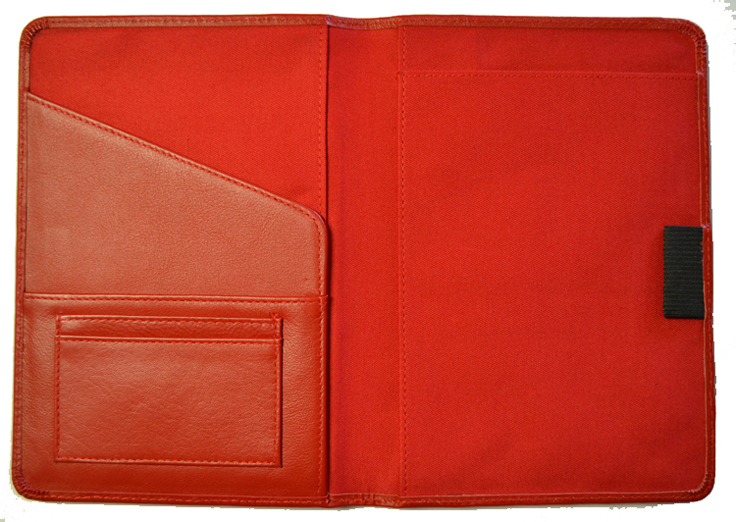 Inside the front cover are three business-card slots and two interior pockets. On the right-hand side are top-loading and side-loading pockets, and an elastic pen loop. 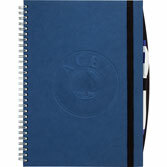 Colors: Black, British Tan and (Green, Red, Black) with contrast stitching Size: 6 5/8" x 4 1/8"
Size: 3 1/4" x 6 1/4"
Features: Locks with a key, and includes a 160-page spiral bound journal with a choice of lined or blank pages. Features: Classic Leather Journals have your choice of 160 page journal, weekly calendar or address book included. 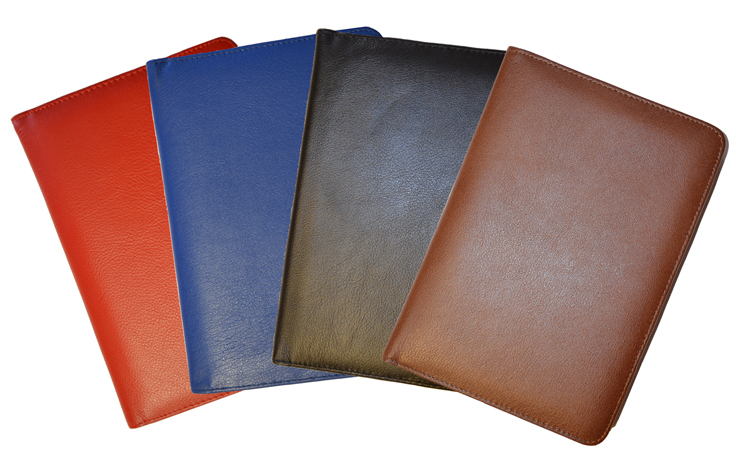 Colors: Black, British Tan, Blue (new) & Red (new) with matching stitching Size: 8 1/8" x 5 3/4" x 7/8"
Features: Premium full-grain leather. Pen loop. Sewn-in leather page marker. Inside pocket for business cards. Ivory pages with gold edge. Front page for personal information. 150 lined pages. Colors: Black. Custom colors are available with a minimum order of 100. Size: 8 1/2" x 6 3/8" x 1 3/8"
Features: Hand-crafted of top-grain leather, with a 160-page refillable ruled journal which includes a 16-page world map. Leather page marker. Colors: Nile Black, Nile Brown, Nile Red, Nile Bone, Jungle Wine & Jungle Black Size: 10 1/2" x 8"
Colors: Black, Blue, Red, Gray & Natural Size: 10" x 7 3/4" x 1/2"
Features: The cover made from 100% recycled cardboard. Recycling symbol is debossed on the back cover. Spiral bound notebook. Includes 100 sheets of recycled lined paper with recycling symbol printed on each page. Features: Recycled cardboard covers and 70 sheets of ruled recycled paper with recycling symbol printed on each page. Elastic closure and pen loop. Includes important contacts page and 3-year calendar. Features: NeoSkin® hardcover wirebound journal with decorative stitching, an elastic pen loop on the cover, three interior card slots and a large interior pocket. 96 perforated ivory ruled sheets and a matching plastic push-action ballpoint pen. Colors: Red, Blue, Orange, Black & Green Size: 9 1/4" x 6 1/2"
Features: 112 pages, printed in gray. Full-color world maps included. Ribbon marker. 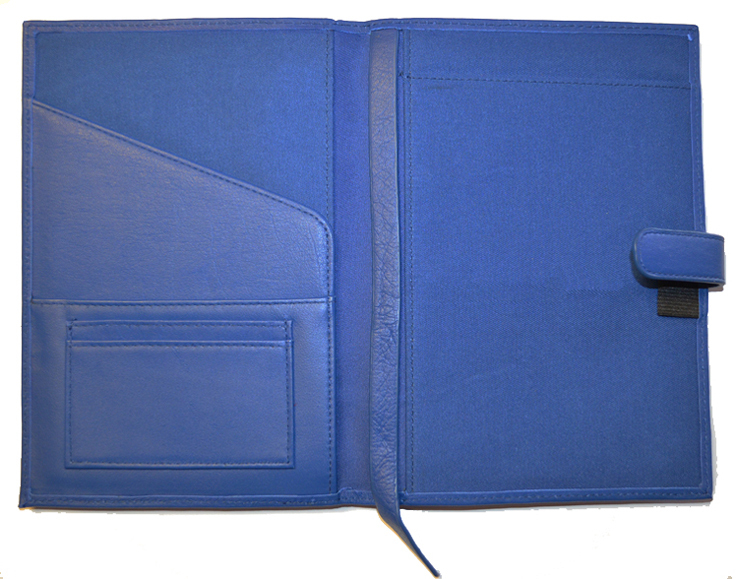 Colors: Navy Blue, Terracotta & Black Size: 8 3/8" x 5 7/8"
Features: Elastic pen loop, tab-and-loop closure and blue and silver ribbon page markers. Business card slot. 100-sheet journal lined pages. Colors: Black, Terracotta, Red & Navy Size: 10" x 7" x 1"